OK, I am pretty new to exchange, and I hate certificates. Not a total newb but don't skip the obvious please. Additionally, I am picking up this system from old admins that left on bad terms. The core problem is this. On setting up a new user on a new computer, I receive a certificate error. I can skip it and it will run through, but my users freak out, and I do not want to teach them to ignore these warnings, so I need to get it fixed. 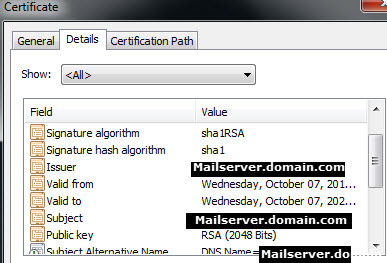 From this, it appears that the Mailserver.domain.com is using a self signed cert, and is also SHA1. There ones listed in the web admin page are similar, only excluding the one that is expired. There are so many, few to none match. No rhyme or reason. I THINK I need to add a good cert from the Sub CA, and then remove the bad certs. But this is a production box, and I am worried about removing certs that haven't expired, bad past experiences. I guess I am asking for some guidance in cleaning up this mess. Get a cert from a CA....GoDaddy is a good one. They also have excellent instructions on how to install. You need a trusted cert from a CA. Make sure you have a folder called "cert" on your C drive. Get the trusted cert, install it, and this should take care of your issues. 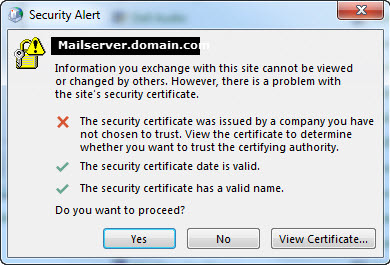 Be sure to get a SAN cert with the names you need...example....mail.server.com, owa.server.com, autodiscover.server.com, etc. When you run the command I gave, you will be able to tell which ones are self-signed very easily. You can use your own CA. That's fine. 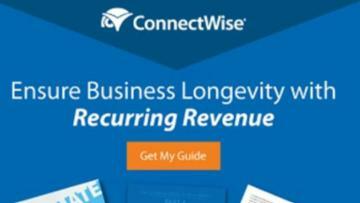 Verisign is another one. Just make sure they are reputable and provide good instructions for installing the cert they sell you in Exchange. Once you have a valid cert installed from the CA, your users will be able to access their email from outside of the office. But my CA is not trusted by the world. View the certificate when you see the popup and look at the cert to see if it is valid .. .also look at the certification path tab. Are each one of those installed on each machine? will show you which certificate (thumbprint) is assigned to Web (w) which is primarily the one we are dealing with here. A CA by default is trusted by the world. 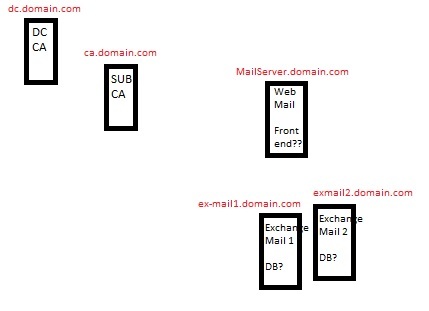 That's why a CA is a Certificate Authority. Run the above command I gave you, look at the results. In there you should see the SANs you need to have put in your cert. If your CA isn't trusted by the world, then you need to find one that is. Verisign, GoDaddy, etc. One cert installed on each server, you don't need one for each machine. A wildcard cert will work but that can have its own configuration challenges. OK, I am ready to start pushing buttons, but I am nervous about this, as I have little xp with exchange. I have no fear of running the PS commands, but How can I "quiesce " one of the servers so as not to impact it? Also, how can I connect to 1 of them specifically to see if my fix works?? Installing a cert from GoDaddy is easy. Just follow their directions. So I called MS, and there was a LOT of command line and cert clean up, to much to mention. My one take away from this was that exchange certificates are at hart just IIS certs, attached to exchange services via command.